Kristin McGee is kind of a fitness rock star—we’ve checked out her work a couple of times here at FBG (see here and here). 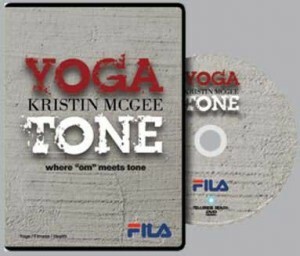 In her latest DVD, YogaTone, McGee pairs traditional yoga poses with light hand weights and standard strength moves to create a new kind of workout. This isn’t your peaceful, meditative, refresh-your-spirit type of yoga DVD. It’s fully focused on the physical rather than the mental/spiritual aspect of yoga, which is fine with me—I firmly believe there’s room for both in the world, and sometimes, you just want to stretch your muscles, you know? It’s split into two 15-minute circuits that go through the exact same workout, which, to be honest, was a disappointment. When I saw that this was two 15-minute circuits, I assumed there the second half would be something new, in effect providing two different workouts. It could have been billed as a 30-minute workout and had the break in between removed—if someone really wanted to do just half, they could still do so easily, but you wouldn’t feel so gypped when you got a second verse, same as the first. I do like McGee—she’s cheerful and pleasant without being annoyingly perky, and she provides solid instruction throughout. There were a few times when the camera angle could have been more helpful and shown her full body when she was describing proper form, but overall, it was totally easy to follow. And, for the most part, it was fairly easy to do. I used 5-pound weights, like McGee, but I really should have beefed it up a little to make the workout a bit more challenging. Fit Bottomed Line: Neither the strength nor the yoga moves are overly difficult—beginners will certainly be able to keep up. Even with heavier weights, I don’t see this being a terribly tough workout, though, especially since it’s just 30 minutes. Hello FBGs, I’m interested in Yoga Tone. Kristin McGee’s website sells the DVD for $15 and a downloadable version for $10. If the 2nd circuit is the same as the first, does the downloadable version come with 2 circuits or just 1 circuit that would take less time to download and can be simply be replayed. I was going to post this question on the website but I couldn’t find a “contact us” page or link. Thank you!